Students in the lab have used a variety of behavioural tests in their projects, such as preference/avoidance olfactory assays, multi-sensory integration assays, appetitive or aversive conditioning, and manipulations of motivation. These tests allow us to investigate the evolution of learning and behavioural control in vertebrates. They also provide us with useful sensory stimuli for functional neurobiology and physiology experiments. 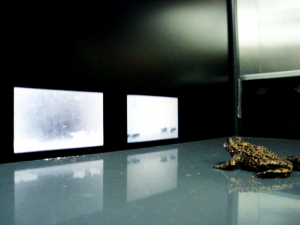 The picture on the right shows a fire-bellied toad attending to stimuli displayed on a computer screen, part of a visual discrimination learning experiment. 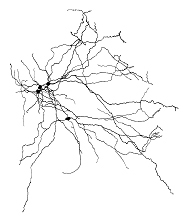 Tract tracing of brain pathways and intracellular labelling of single/few neurons is performed in in vitro brain preparations. A fascinating feature of the brains of anamniote vertebrates is that you can keep them alive in physiological solution for an extended period of time, allowing for experiments with neurotracer substances directly on the isolated brain. The detection of tracer substances on brain tissue can be done using either light or fluorescence microscopy. 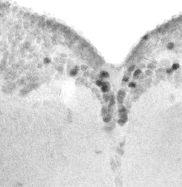 The micrograph on the left shows the cell body and processes of a mitral cell contained within one brain section of the salamander accessory olfactory bulb labelled by intracellular injection of biocytin. The figure on the right shows the reconstruction of a cluster of thalamic neurons in the fire-bellied toad. We are equipped with the software Neurolucida (MBF Bioscience), which allows reconstruction of neurons in 3D-like fashion. Methods that indirectly measure brain activity are used and in development in the lab. In amphibians, these methods enable the study of whole brain responses in one experiment. 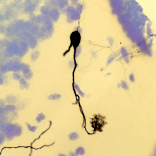 Immunolabeling against c-Fos, a useful marker of the effects of various stimuli on the nervous system, can be performed to detect the Fos protein. In collaboration with the Heyland lab, we are also developing the method of in situ hybridization to detect c-fos mRNA, as well as other neuronal molecules. These experiments will help determine which brain regions are engaged by the behaviourally relevant sensory cues and conditioning procedures established in our behavioural studies, as well as the neurotransmitters and modulators involved. The micrograph on the left shows c-Fos labelling in the salamander raphe median obtained after treatment with a courtship pheromone. The paired micrographs on the right show c-fos mRNA signal (antisense) and control (sense) in the preoptic area of the fire-bellied toad. Neuroanatomical experiments will determine the brain regions of interest for physiological investigations. Mechanisms of sensory integration in regions critical for behaviour will be investigated first in the in vitro brain preparation by artificial sensory stimulation, which is accomplished by stimulation of sensory nerves and brain regions that relay sensory information. 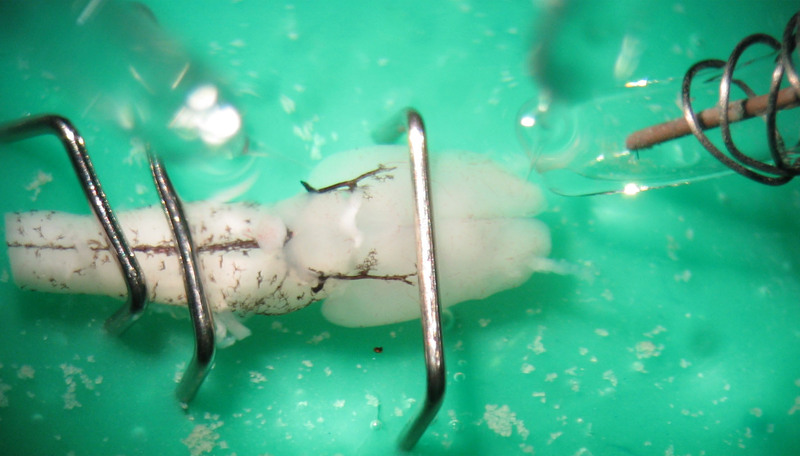 The picture below shows a suction electrode (top right) used to stimulate electrically the right olfactory nerve branch in a salamander brain (viewed ventrally). 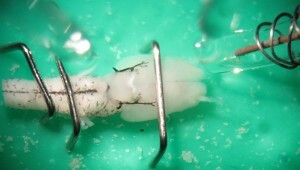 The presence of a recording glass electrode aimed at the right caudal telencephalon can be seen on the top left in the picture. In vivo extracellular electrophysiology could then be used in immobilized animals to investigate more realistic sensory processing using behaviourally relevant sensory cues. The use of multi-neuron extracellular recording allows the study of information processing along sensory pathways. 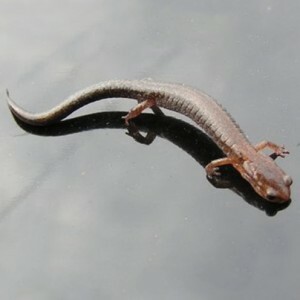 Here, the vomeronasal pathway of salamander is of particular interest because it displays few stations between the receptor neurons and the regions of the brain involved in behavioural control.